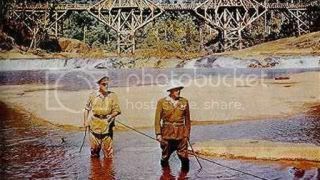 The Bridge on the River Kwai is effective filmmaking at its worst. The technical aspects of the film are there, along with a slew of strong performances, but its sense of emotional resonance is muted. It’s been a problem I’ve had with other Lean films, particularly Dr. Zhivago. And much like Zhivago, I found there to be a disturbing lack of character motivation. I constantly had to question the behavior and motives of Kwai’s characters –ultimately, I can’t say Lean and writers Carl Foreman and Michael Wilson provided three-dimensional characters. The ideology that Kwai posits is problematic. Col. Nicholson (Alec McGuiness) emphasizes conviction to civilization through law – he recites the Geneva Convention, noting that officers do not take labor positions in prisoner camps. Nicholson’s conviction to law makes him out to be a revered figure in the film, but there’s little debate over the formulation of law or the forces that impose it on others. While Nicholson is isolated, his fellow soldiers work. Nicholson’s character is inherently flawed as stubborn, and while his comeuppance at the film’s conclusion may question his ideology, it still portrays him as a tragic hero, which was something I could never go along with. Kwai’s sense of ethnocentrism is particularly disheartening as well. Foreman and Wilson write the film as a means of establishing that the Japanese are inherently incapable of building the bridge effectively, whereas under the leadership of British rule, they are able to build a fully functional bridge in record time. The down-talking becomes overbearing and was never an aspect that was addressed by the film’s conclusion. If there’s one aspect that I can appreciate about Kwai, is that it rarely bores. At over 2 ½ hours, I constantly found aspects that I could appreciate, whether it be its technical feats or accomplished performances. But these aspects are purely superficial, which sheds light on Kwai’s biggest problem – it’s a surface film with not a whole lot of depth to it.